Hand painted in red, blue and black, it has a jolly Roger motif, cloth sails, and working anchor. 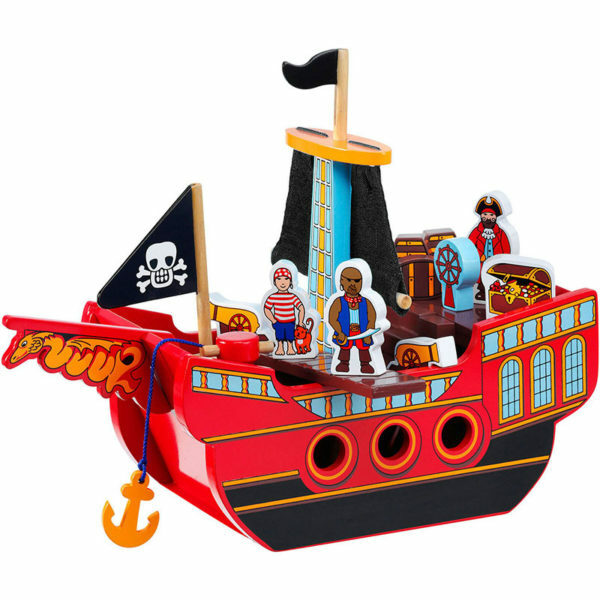 This beautifully crafted wooden toys includes three pirates, a capstan, ships wheel, two cannons, a treasure chest, three barrels, steps, a plank/ladder, plus a detachable figurehead, decks, ramp and main mast. All pieces store neatly in the bottom of the ship for easy transportation. A wonderful traditional wooden toy that will keep children entertained for hours. Let the adventures begin! 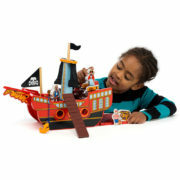 This Pirate Ship is another wonderful wooden Fair Trade toy from Lanka Kade.